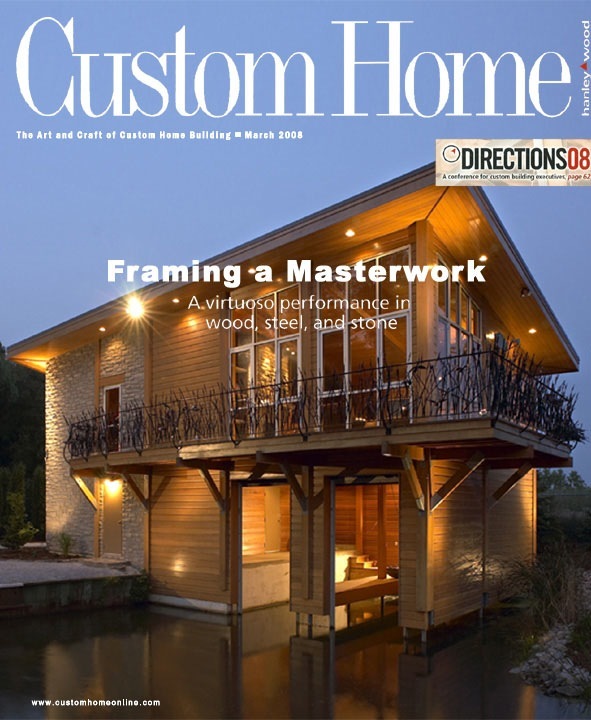 A virtuoso performance in wood, steel and stone. 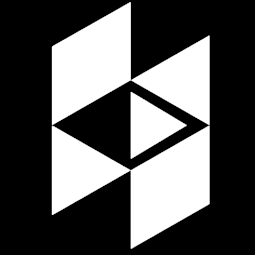 Hunting cabins tend to be basic, bare-bones shelters that act as a storage space for guns and provisions. 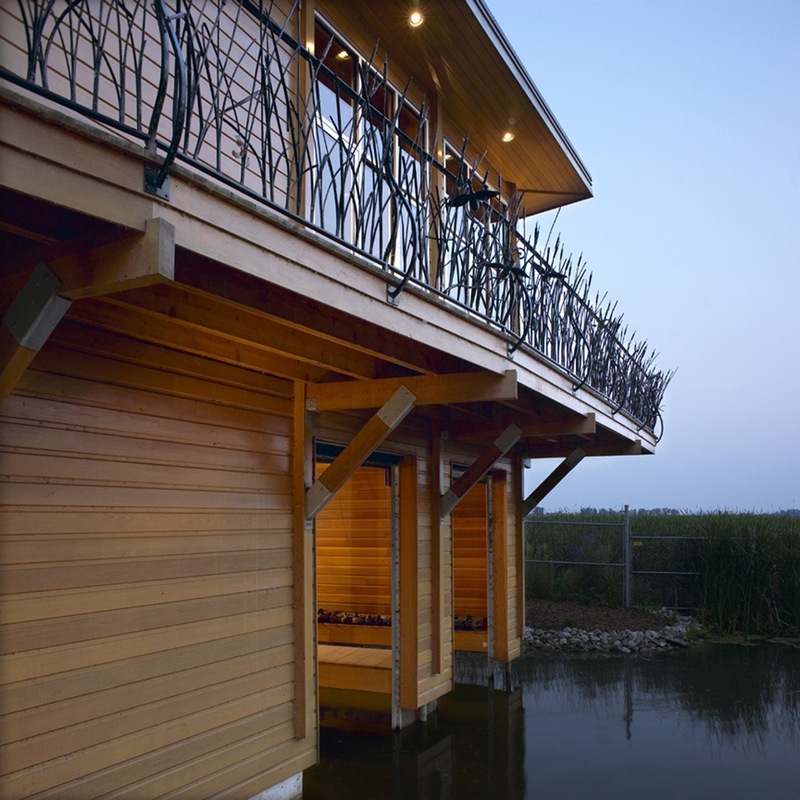 Not so in the case of this Ontario, Canada, boathouse for an avid duck hunter. The 1,930-square-foot building sleeps eight and features plush furniture, a well-stocked kitchen, and satellite TV – all the comforts of home in a cozy, wood-paneled setting. The relative luxury notwithstanding, the project clearly makes hunting its top priority. An upstairs gunroom safe holds about 30 weapons, saving the owner the trouble of transporting them from his full-time residence in Michigan. “It’s a hassle to take guns across the border,” explains architect Kevin Akey. Walls of Cor-Ten steel enclose the gunroom for extra security. The boathouse sits on a marshy tributary of the Detroit River, half on land and half over the water. Two slips in the over-water portion house the owner’s hunting boats. “It’s a staging point – they pull the boats out and travel to five duck blinds throughout the marsh,” Akey says. Other spaces on that lower level include a decoy storage area and a room for changing into and out of duck-hunting gear. A pump located about 50 feet away allows the owner to control the marsh’s water level. During the off-season, a lower waterline lets vegetation flourish, the better to attract ducks once hunting season begins. By adding water in-season, the hunters expand the area where the ducks can land. The garage abutting the boat slips provides storage for bags of duck feed, which are transported up to the boat slips on a handy conveyor belt. 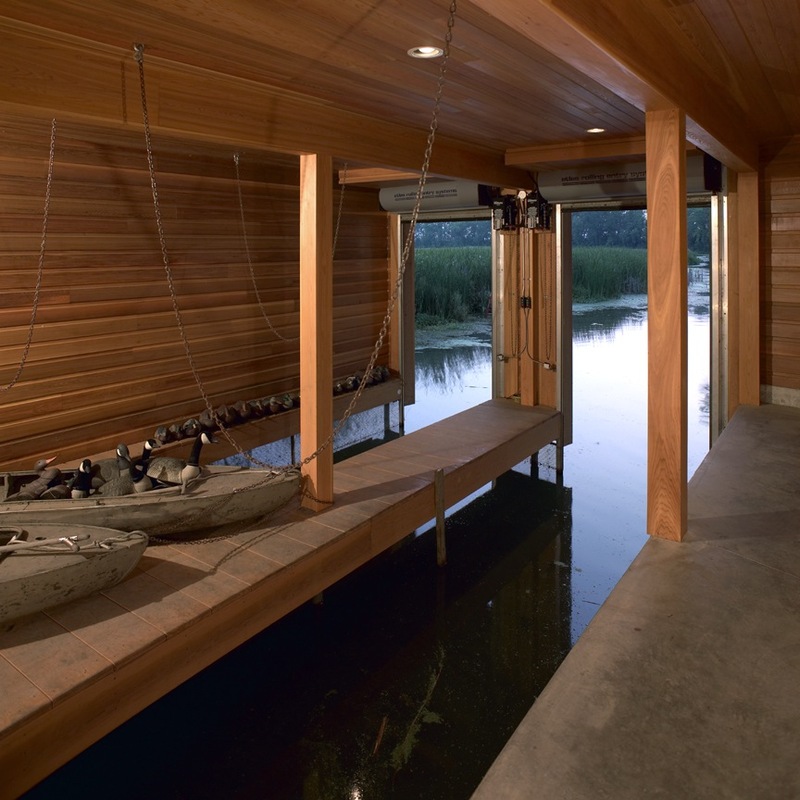 Akey and contractor Franz Dalla Bona decided to site the boathouse atop a series of wood pilings driven deep into the ground beneath the marsh. Given the watery setting and the area’s harsh climate, sturdy, low-maintenance building materials were essential. Sealed cedar siding, stone and standing seam metal roofs make up the project’s exteriors. 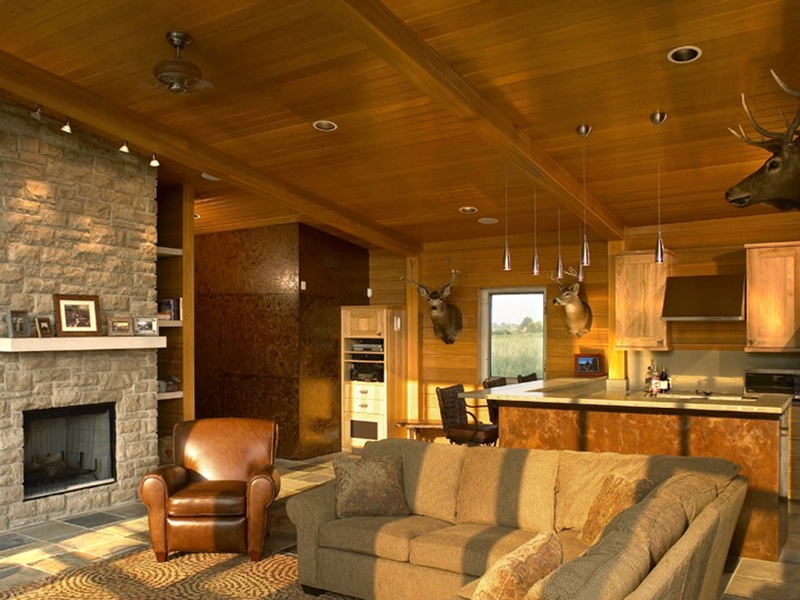 Tongue and groove cedar paneling covers most of the inside rooms, with additional stone and Cor-Ten detailing. Reminders of the building’s primary purpose infuse the space, from the bullet casings embedded in the concrete kitchen countertops to the custom made iron exterior railing. By incorporating these touches, the building pays homage both to the sport of hunting and to the natural environment of the marsh.